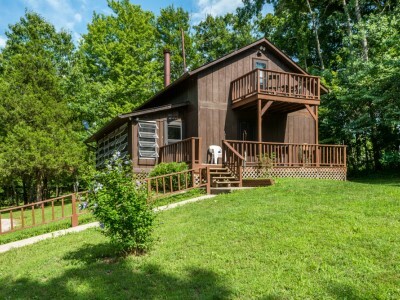 Take a meandering drive through southeastern Brown County and you’ll eventually come upon the Squirrel's Nest Perched on a hill, you’ll have a bird’s-eye…or maybe we should say: a squirrel’s-eye view of the pretty countryside that surrounds this quaint little cabin. After you’ve parked your car and climbed a few steps, you’ll step into the enclosed front porch and through the main entrance to the house. A compact but efficient kitchen features a gas stove and stainless steel fridge with icemaker, plus cookware and dishes…so you can make your special someone’s favorite meal…just as if you were home. A nicely sized dining table can seat four people comfortably. The adjoining paneled living room is cozy with a sofa, a couple of easy chairs, as well as a gas fireplace (seasonal), tucked into the corner. A flat-screen TV is positioned kitty-corner from the fireplace so that every seat has an unobstructed view. You’ll also find a small bath located just off the living room. When Mr. Sandman comes a-callin’, you can go upstairs and take your choice of either one of two bedrooms. The larger bedroom has its own little outdoor balcony, and private bathroom. Both bedrooms have queen beds for a good night’s rest, and of course, sheets, blankets, pillows, and towels are provided for you. You’re sure to appreciate the hot tub (on the enclosed porch) after a day of exploring the many adventurous activities Brown County has to offer. Having some hot dogs and marshmallows on hand will assure that you make proper use of the campfire pit located a few steps from the cabin…so be sure you add those to your grocery list! If you enjoy seeing some of our local artisans engaged in their craft, Squirrel’s Nest isn’t far from Chris Gustin’s Homestead Weaving Studio; and the infamous Story Inn is also close by. Drop in for a delightful dinner and to see the restored village of Story, Indiana. There are lots of things to do while you’re in Brown County, so come prepared to try something new. Have you taken a ride through the trees on a zipline? How about chasing your partners around with a paintball gun; or a bow and foam-tipped arrow in a game of archery tag? Maybe you’d prefer to pack a picnic basket and find the perfect vista for a leisurely lunch in Brown County State Park. Some other suggestions include a short drive into town to browse the selection of awesomeness in the 200+ shops in Nashville. Venture a bit farther out to Bean Blossom and you can visit the Bill Monroe Memorial Bluegrass Park & Museum, Plum Creek Antiques, and Brownie’s Bean Blossom Inn, or The Flower & Herb Barn Nursery/Farmhouse Café. A few miles east of Bean Blossom, you’ll find Gatesville General Store and their homemade breakfast and lunch-time treats. Lots of people who are into panning for gold go there to dip and dunk their sieve in hopes of finding a prize of some gold flakes, or even a little nugget. Simply driving around our county is a day well-spent, as you take in views of our lush vegetation, and enjoy glimpses of local wildlife scampering about. Come soon…come often…it’s beautiful here all year round! The on-site owner, respectful of your privacy, is available for those who want sightseeing tips or restaurant recommendations.